After making several batches of butter this week (I keep telling you it’s really easy), I was left with several cups of buttermilk. Since I had more time yesterday morning, I made a big batch of buttermilk pancakes for Cherub. 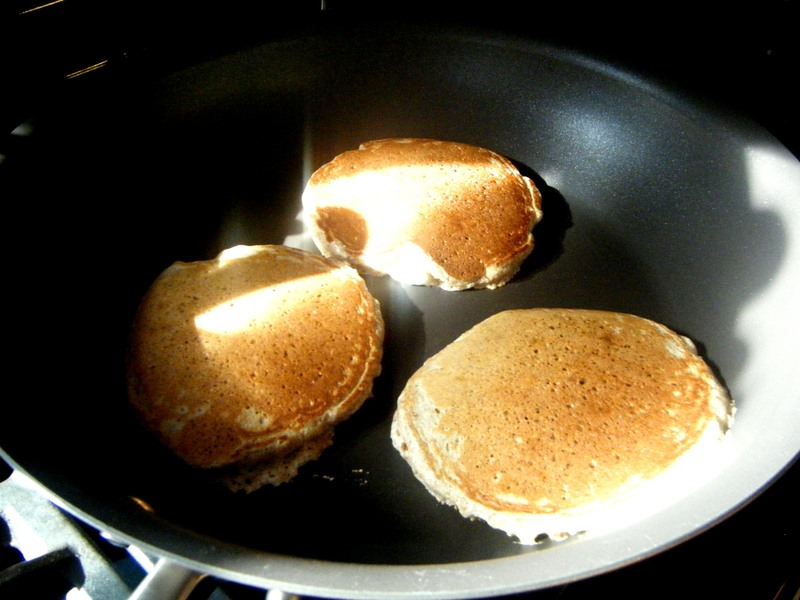 I used whole wheat flour from Flying J Farm, home churned butter, Holistic Acres eggs and all that Snowville buttermilk. I used James Beard’s recipe from his American Cookery book, but added a little sugar, bumped up the soda just a bit and it needed a bit more flour (all purpose white) because homemade buttermilk is thinner than the cultured you’d get in the store. We’re not normally a whole wheat flour kind of a family, but these were really delicious. They came out fluffy and with a nice texture from the whole wheat. Cover them with lovely Ohio maple syrup and you’re laughin’. Cherub devoured them and we still have nice leftovers for school mornings like this one. You could even freeze them. Only non-local ingredients were baking soda, salt and granulated sugar. For complete sourcing see the Farms and Producers page.